I know exactly what I’ll be doing this weekend, and it won’t involve a trip to the mall. Let other people—millions of other people—desperately compete for parking and the attention of department store clerks. I’ll be home keeping quiet company with my smoker, creating a gift that will be appreciated by nearly everyone on my holiday list: homemade jerky. Want to join me? December is the month of miracles and magical thinking. And why lean meat, seasoned and dried to within an inch of its life, is so darned good is beyond me. It is one of the mysteries of the universe. We made a few batches on the set of Project Smoke, Steven’s latest show. Suddenly, everyone on the crew seemed to have a transparent excuse to pass through the kitchen tent. The draw? Steven’s Sriracha Beef Jerky. Jerky (from the South American Quechua word ch’arki) is a $1.5 billion industry in the U.S. Sales are up 46 percent since 2009. No surprise, really. It’s a terrific snack—high-protein, low-carb, gluten-free, low-fat. Even our primitive Neolithic ancestors, who smoked and dried it over their fires, appreciated jerky’s portability and long shelf life. It’s still a favorite of today’s nomads and road trip takers. 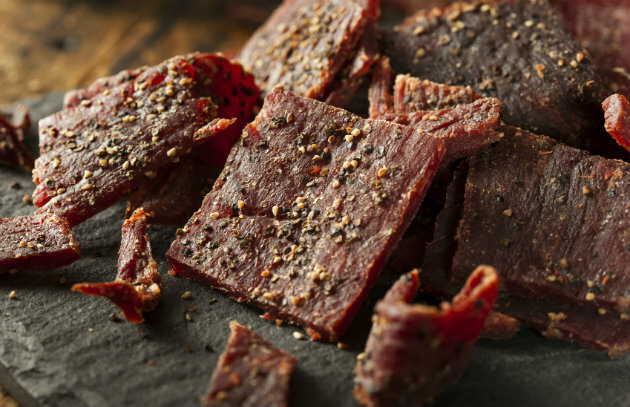 You can buy jerky through high-end food purveyors or at gas stations. But homemade jerky…well, it’s out of this world. Here’s a distillation of my 25 years of experience as well as links to two of our favorite recipes. Use only lean cuts of meat. Fat resists drying, and will shorten the shelf life of jerky. For beef jerky, use top or bottom round, flank steak, or sirloin. Partially freeze the meat before slicing against the grain with a sharp knife. (For chewier jerky, slice with the grain.) Turkey breast, lean cuts of venison or other game meats, and even chicken breast are good candidates, too. Slice into strips that are 1/4-inch thick or less. It’s optional, but I like to use sodium nitrite (a.k.a. “pink salt” or “curing salt”) in my jerky marinade. It gives the meat translucency and improves the chew. Only 1 teaspoon is needed for 5 pounds of meat. Measure accurately. Morton’s Tender Quick, which is widely available in supermarkets, is another option. You’ll need about 2 tablespoons for every 5 pounds of meat. Marinate the meat for at least 24 hours in the refrigerator before smoking or dehydrating. I use resealable plastic bags and turn them every few hours. Before smoking or drying, drain the meat on multiple layers of paper towels. If I’m in a hurry, I sandwich the meat between paper towels and use a rolling pin to press out excess moisture. Set up your smoker or grill according to the manufacturer’s instructions and preheat to 165 degrees. You will need only a few coals if working with a charcoal grill. Presoak wood chips in water for at least 30 minutes, then drain before tossing on the coals. Replenish as needed. 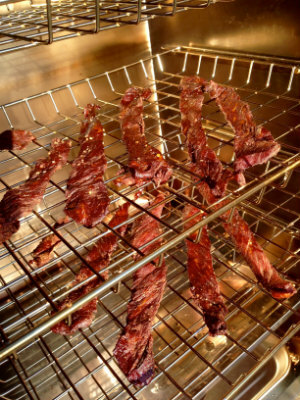 Stovetop smokers (such as Camerons) can be used to give the jerky that home-smoked flavor. You can finish drying the jerky in a low oven if necessary. Set the temperature as low as you can, then prop the door open with the handle of a wooden spoon to allow the moisture to escape. Vacuum-sealers give your jerky a professional-looking touch. Advise the recipient of your gift to store the jerky in the refrigerator. Not likely it will last long, though.